a book? a book? an eBook!! I wanted to share a few new sneak peeks with all of you as I also announce the winner of the Handmade Winter eBook! I’m pretty proud as you can imagine, and I really hope that if you purchase this book you will let me know your thoughts on it. I wanted to give you a taste for what is contained in here. There’s a whole section dedicated to just cocktails! 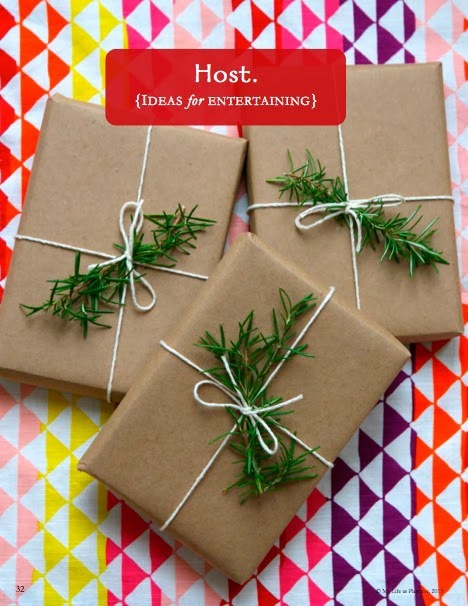 And one for entertaining/hosting. The projects in here are so do-able and awesome, and I don’t use the word awesome lightly. There’s projects that I can’t wait to personally make that were contributed by very talented bloggers and makers! Craaaazy. So much to do and only the 5 hours of my kids' camp hours to accomplish it. Throw in some other unpleasant surprises and you have an insane week for me. Dare I say #1, because you know what that means, there will have to be a #2, #3, and so on. Awhile ago, maybe early July or end of June, I sent out an email to my closest girlfriends asking their opinion about an idea I had which was inspired by an invitation I stumbled upon on Pinterest. 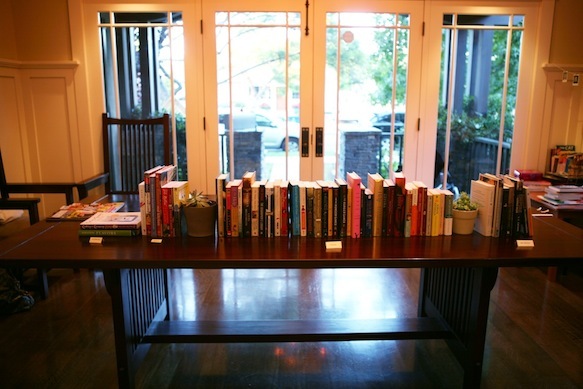 The idea was to have a girls’ night at my house where we could do a book swap while enjoying appetizers and cocktails. If you can believe I heard back from about 95% of them saying “we are there”, “what’s the date”, “tell me what to bring”. So the planning began. 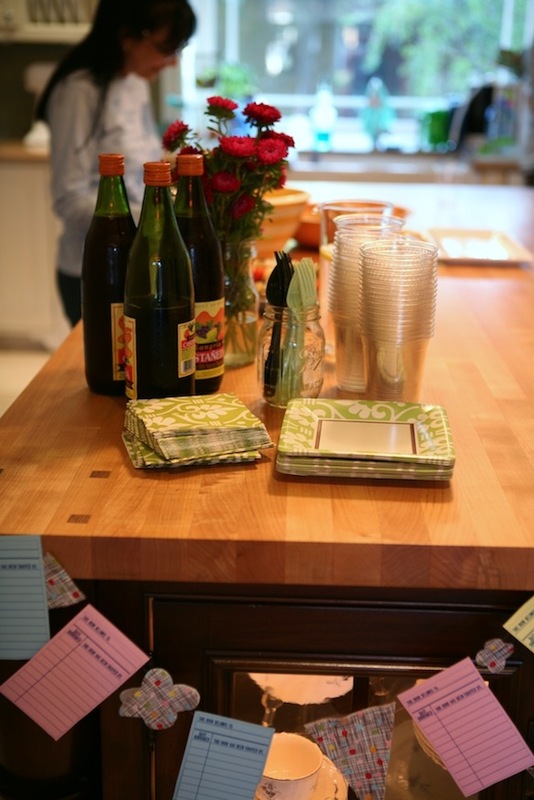 I had a lot of fun prepping for this party and I think all the girls loved it. They brought the yummiest treats. And I walked away with 4 new books to read. Everyone asked when the next one would be, but I think I need at least 2-3 months before I finish these books and can think of getting new ones. Thank you ladies to everyone who came! I think we had 18 there this night. 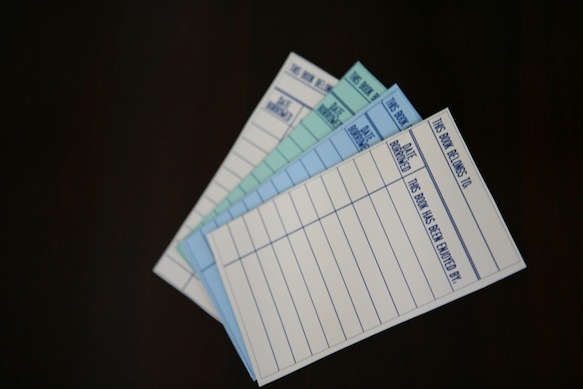 Once each person RSVP’d to the evite, I emailed them this attachment found here, and asked them to please print out the cards, cut them out and insert them inside their book covers with their name/number/address, to be sure the books all came back to their rightful owner. I printed a stack of them in heavy card stock and had them available in case anyone forgot. I also used the cards as part of decorations, and sewed a little bunting to decorate the food area. I served Sangria and a friend brought champagne. 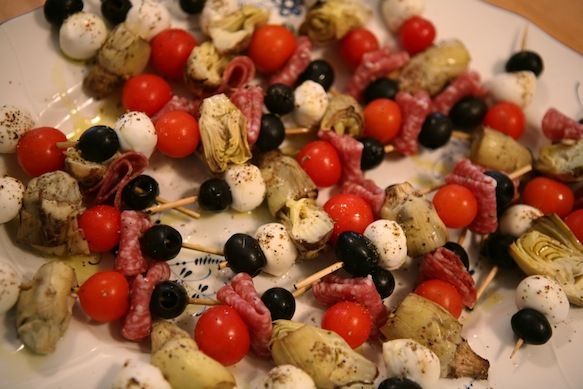 I also made this antipasto skewer platter. 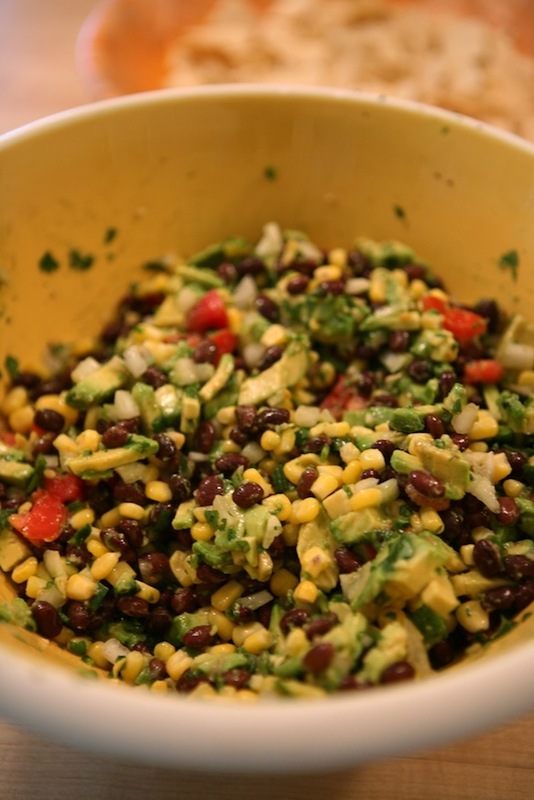 This black bean and corn salsa was out of this world. I found the recipe on Pinterest and have made it several times since the book swap. It disappears every time in a matter of minutes. You can find the recipe here. However I substituted grape seed oil for vegetable oil. 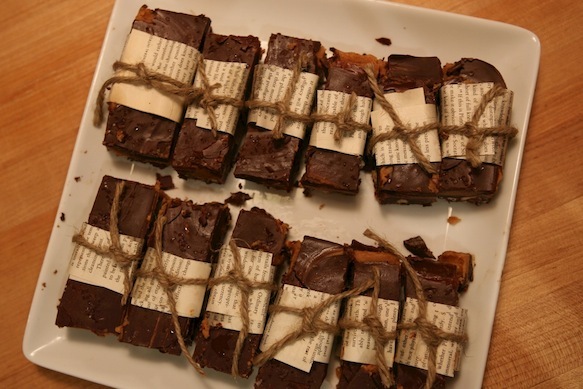 Tanya made these AMAZING peanut butter and chocolate bars. When I say they were amazing, I mean I couldn’t STOP eating them. They were delicious. 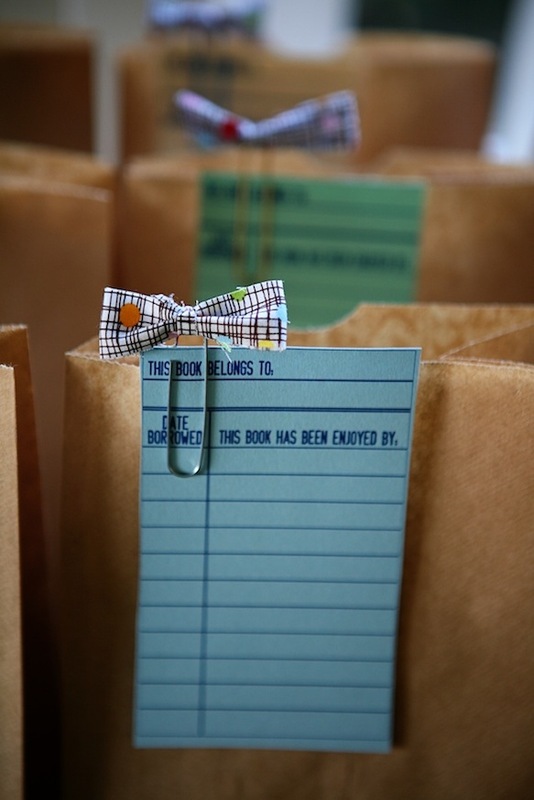 And how cute that she wrapped them in little book pages with twine! 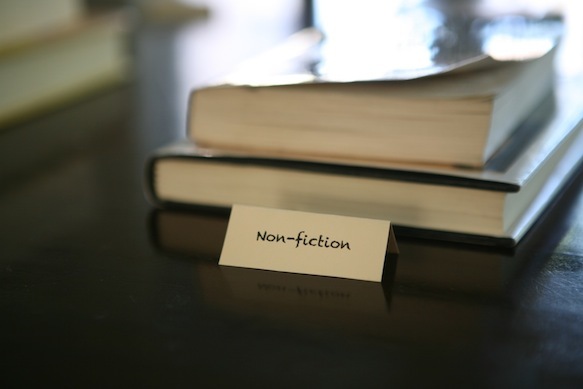 Here’s a photo of the book table, I used little card stock printed out with categories to keep everything organized. 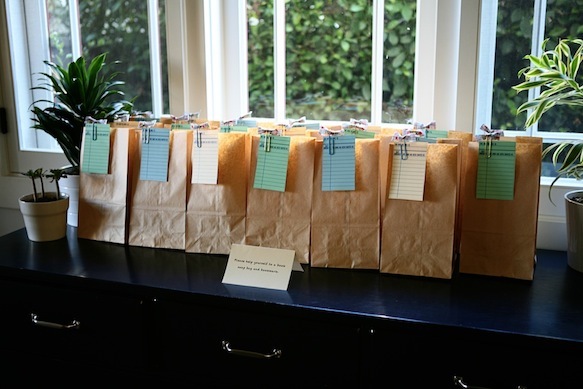 For little favors I had a table set up with book swap bags along with little bookmarks that I made for everyone. 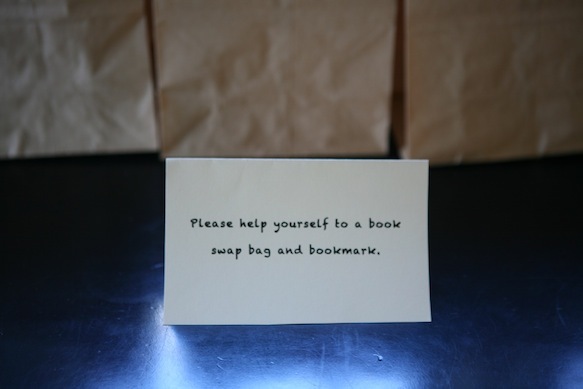 There you have our little book swap party! It was really a lot of fun, and I think I may even open it up to any husbands next time that love to read. Aaron snuck a few of his books onto the table, and came away with one or two. He definitely thinks men should be invited next time so that he has more in the non-fiction, historical, section to browse through.